In preparation for the Grand Masters World Tournament Trophy in Barcelona in June, twelve of the Scottish Thistles squad and three additional players travelled to Bedford on Saturday 19 May and Sunday 20 May to play two matches against Irish Shamrocks, composed of Irish players not selected for the Home Internationals and World Cup. 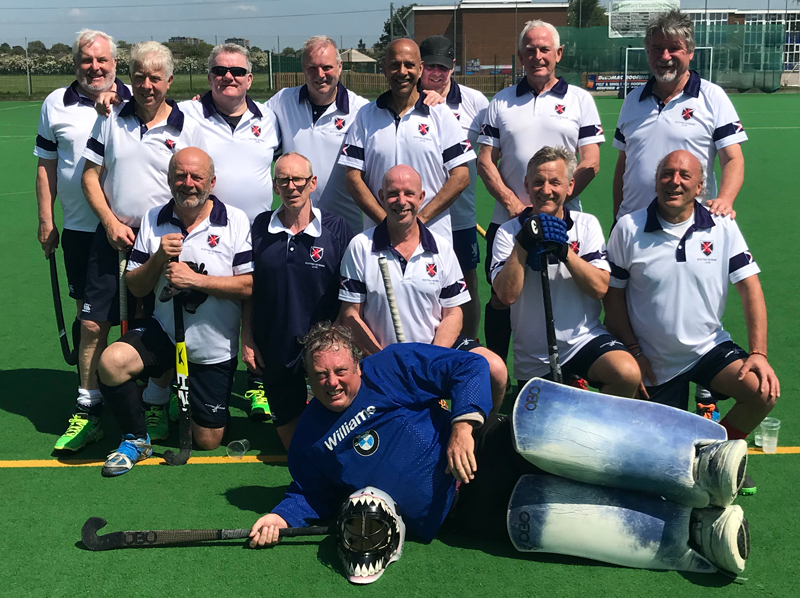 In the event, the Irish included four of their international squad for the Grand Masters World Cup, but both matches resulted in wins for Scottish Thistles, which must give them encouragement ahead of their big tournament in Spain. The Scottish Thistles LX Team for Barcelona travelled down to Bedford for a training double-header against the Irish Tournament side on the 19th and 20th May. This Irish side included four players from the main 'elite' quad and was a very strong group indeed. However, Stuart Stephen, Neil MacKenzie and Mike McInally had been working on the best structure of the team for Barcelona over the previous few weeks, especially during Tilburg, and communicated their ideas to the group during the hour long coaching session before the first game. The first game on Saturday saw us playing in 24 degrees of heat on a hard pitch and we started very well indeed. In the first and second quarters we went two goals up, the first through a well executed short corner despatchd by Gurdial Duhre and the second from a move which started in defence and was worked through the midfield to Gurdial who once again had a shot in the net. Indeed the movement of players off the ball and the general 'shape' of the team was excellent, and the other forwards had chances which did not result in an increase in our lead. We wanted to try one other 'experimental' shift in personnel for the third quarter and this saw the Irish put on a high press, get several short corners and claw back two goals to make it 2:2 before the fourth quarter. A 'no panic' discussion took place before the fourth quarter and we went back to our original plan and stopped the impetus that the Irish lads had built up. The penalty shoot out to decide the match saw us winning by four goals to three. This was certainly one of the most impressive performances from a Thistles team that I have been involved with over the past few years. As always with a Thistles tour, although this was a serious training event, we had a night out with the Irish lads in Bedford and then back again at the Hotel. It would be fair to say that the coach and Kerro won that night out as well, although Sean the Irish coach did give it a good try! The second game on the Sunday saw us start with a slightly rearranged team due to injuries, but the general shape and positioning of players was very good. We scored in the first quarter through Rob Houston-Campbell who carrid the ball into the circle and beat the Irish goalkeeper to put us one up. Pllaying a 'high-press' and 'zonal' formation against the 'passing' game of the Irish, Scottish Thistles were really not at all bothered in their own half apart from the odd breakaway. We did not make the mistake of the previous game in the third quarter and kept our shape and a clean sheet. However, as legs got tired and the Irish had two more substitutes than us they managed to get a serious advantage in the final ten minutes of the fourth quarter and seemed to have short corner after short corner. The defence held firm, even playing two short corners after the final whistle had gone. So a second win of the weekend for Thistles. On a footnote, we felt that some penalty shoot-out practice would be good to have just as practice, not sure that Ian the GK appreciated this though. Five different Thistles players 'volunteered' to take them and it was a joy to behold Keith scoring with a 'through the leg dribble' while others with outside turns, undercuts and lobs could not get past the Irish keeper. (Keith promised me a pint if I mentioned this).